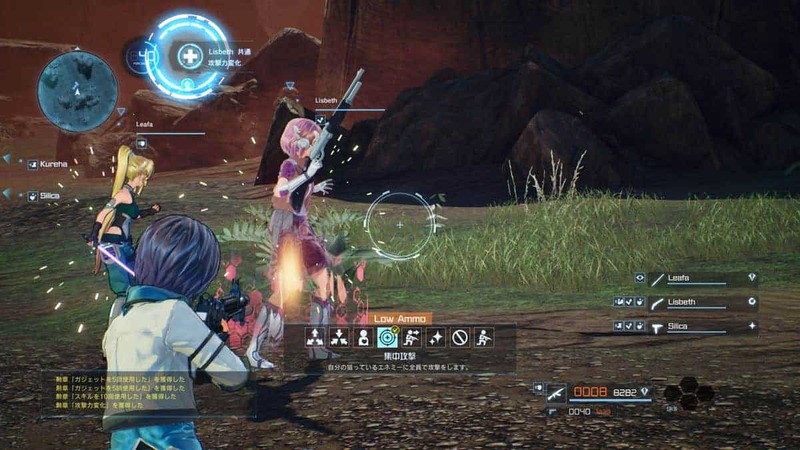 This Sword Art Online: Fatal Bullet Weapon Arts Guide will tell you about all of the Weapon Arts currently found in Sword Art Online. The guide will mention the Weapon Arts currently available for the weapons and explain what those weapon arts do. Weapon Arts are one of the ways through which depth is added into Sword Art Online: Fatal Bullet. These special attacks are charged up and then used. All of them have a specific effect which makes using them quite worthwhile. There are a few different Weapon Arts so learning them can be a little problematic. Also, check out our Gadgets Guide to learn everything you need to know about Gadgets. Weapon Arts can be purchased from Argo. Consider the Weapon Arts like you would consider special moves or super attacks. You have a meter for your Weapon Art. The meter is charged whenever you fire that particular weapon. After some time, your meter will be filled up and your weapon icon will be glowing. When your weapon icon is glowing, it means that you can now use your Weapon Art. To use it, simply press R1 and L1 together. This will activate your Weapon Art and you will be able to reap its rewards. Before you do that, however, you need to know all about what your Weapon Arts do. Let’s go ahead and see what does each Weapon Art do in the game. First of all, we have the Handgun Weapon Art. This will reduce the reload time for your weapons and will also have an impact on the time it takes for your skills and gadgets to recharge. The Shotgun Weapon Art is completely different. It provides damage rather than utility. When you use this Weapon Art, a flaming shot is fired which will explode on impact. The Assault Rifle Weapon Art is also somewhat similar, as it allows you to fire flaming bullets for a short amount of time. The Sun-Machine Gun Weapon Art will fire bullets in a spiral around you. Essentially, a lot of bullets will be fired and you will deal Area of Effect damage to all enemies near you. The Sniper Rifle Weapon Art will fire an extremely power bullet which will have massive amounts of penetration. Perfect for hitting multiple enemies or destroying a high value target through the wall. The Launcher Weapon Art fires a bomb which has a ton of mini grenades exploding on impact. Essentially, it is best to consider this art as causing a small explosion over an area. The Gattling Gun Weapon Art is somewhat similar, as a shockwave is sent to surrounding enemies when you strike the ground with your gun. The Sword Weapon Art only really unleashes a lengthy Skill Connect combo, there isn’t really much to add after that. Combining your Sword with a Gun will do a combo that is roughly similar to this one as well. That is all we have for our Sword Art Online: Fatal Bullet Weapon Arts Guide. Let us know if we missed something using the comments section below!